Thank you so much, Bern, for the opportunity to introduce myself to your readers here at your amazing blog. I'm becoming something of a Diva myself, in my 'maturity' years. I've been getting pointers from your Diva daughters all along! I wear a lot of hats! Before this article is over maybe I can earn an honorary "Diva Debbie" title. 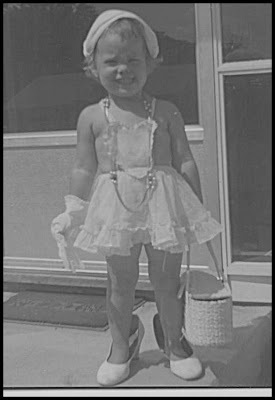 Here's some evidence of my early diva status. It's good to be able to laugh at yourself! I am the hardest working diva, that you've never heard of before! Yes. I have written and recorded over 100 original songs for children. Yes, I have turned three of my songs into the traditional hardback picture book format. Yes. I have won national awards. Yes. I travel the country (and the world) sharing my work with educators and parents. Yes. 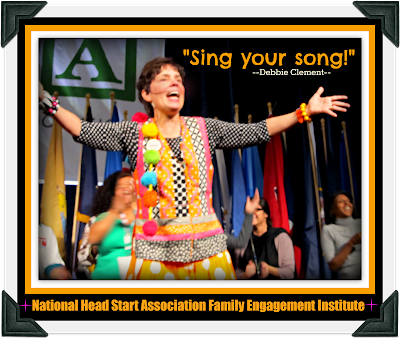 I will be give the opening KEYNOTE for the national Kindergarten conference! Yes. I realize. You've never heard of me...... [unless you're a blog stalker or active on Pinterest.] Yup. The life of a diva-in-the-making. So I'm especially grateful to have the opportunity to introduce myself. My book's text are the lyrics of my songs. 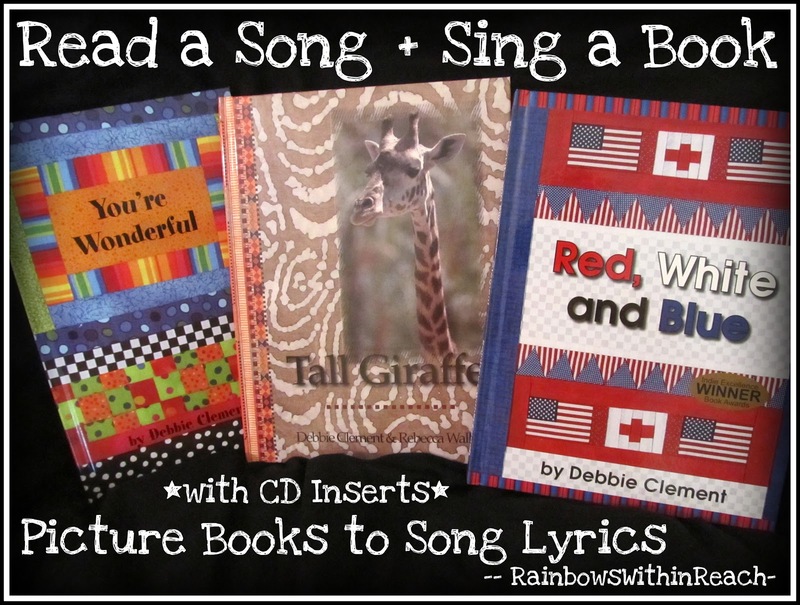 To make the bridge between 'singing' and 'reading,' my books include a CD insert of the song inside the cover. The young child first becomes mesmerized with the beat of the music and then quickly joins in with the repetitive lyrics. After a few trips through the song and book combo, the early reader begins to notice that those print hieroglyphics relate to the words being sung. Before you know it the child exclaims, "MOM, I'M READING!" GeeGee and my own 'WonderBoy' in Concert Together! It is just that joy and burst in confidence that delights me. As a parent, grandparent and teacher-of-teachers, it is that "Aha Moment" when all the dots connect, that a quantum leap of 'academic' progress is made. Let's connect the dots! Let's sing and read. Let's dance and read. Let's sign and read. Let's paint and read. Let's laugh and read. Well. You get the idea! Music is such a powerful tool. I've written about it as a 'motivator' in this article. 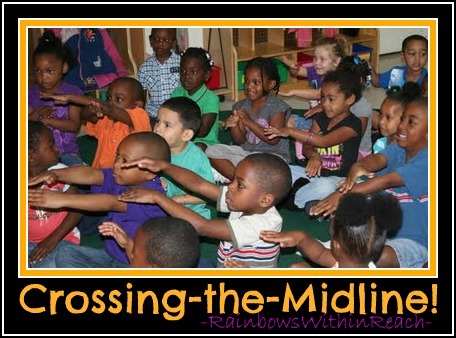 I've written about how to add choreography to songs and why there is so much significance in crossing the midline. My songs are filled with rhyme and repetition. There is all sorts of documentation about why and how rhyme relates to reading. I took a long hard look at those connections in this "TOP 10 LIST: Importance of Rhyme" that was developed for the Kid Blogger Network -- where our hostess Bern and I first met. That list is filled with inspiration for parents (and grandparents) to 'play' with rhyme as the day unfolds. Let's take a look at how I translate my songs into picture books. The illustrations that fill my books are made from fabric as small quilts that I have designed and sewn together. 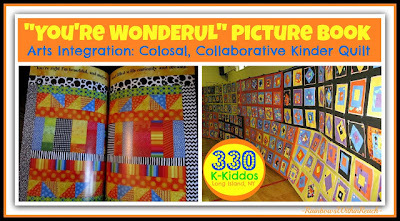 You know that you're a developing diva when a school building filled with 330 kindergarten students have responded to your graphic quilts by making a colossal collaboration to welcome you into their midst. This gigantic quilt spanned across their entire gymnasium! It is in response to my first picture book entitled, "You're Wonderful." The former art teacher in me rejoices to see such a spectacle! Here's a YouTube video shot in front of that very backdrop! We're singing my classic song, "Glad I'm at School Today!" That's my favorite thing. To walk into a new school and see the work that students have created in response to my projects. 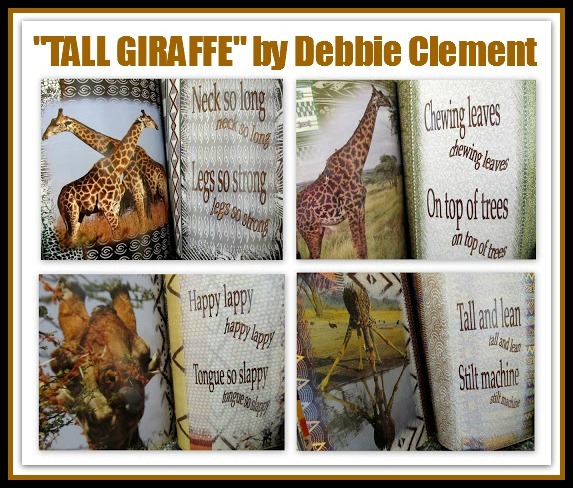 My second book is entitled "Tall Giraffe" and features amazing photographs of this beloved animal in Africa. The photos are framed by African fabrics that were 'digitally quilted' on the computer. This whole book is the effort of a 'family project.' My niece took the giraffe photos for me on her mission trip to support children with AIDS in an African orphanage. Her mom/my sister worked at length behind the scenes to help me with the book's layout and design. Then my husband acted as 'publisher' and brought the work all together in finished form. YEAH, team! Now take a look at my newest baby. Another labor of love. 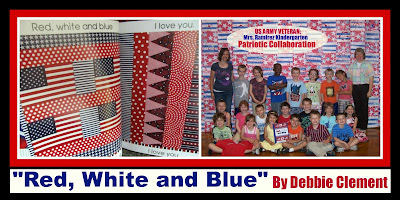 My newest picture book "Red, White and Blue" is patriotic, in that I wrote the song in the immediate aftermath of September 11th. It celebrates the flag and the diversity of our country: in both our geography and our people. It took me years to bring the book format to fruition. (I am a two time survivor of early stage Breast Cancer and that slowed me down considerably.) Imagine my emotions to see this project unfold in kindergarten in response to my book. Yes. I could go on and on and on. I have five years worth of blogging articles that document the most recent of the past seventeen years since I launched my company. In summary? Collaboration is where it's at! There's power in collaboration. I am the 'editor-in-chief' for the collaborative blog, "PreK+K Sharing." We have over 30 authors who contribute regularly from their area of expertise. Most recently we have opened a collaborative 'store-front' of materials suitable for this age group. We call it our Early Education Emporium. The links in today's article direct you to this collaborative effort. I am now uploading 'digital versions' of my work for your immediate download. My newest technological adventure is to make Author-Illustrator SKYPE visits! I just began this newest technological journey as the school year ended and have already visited 10 different schools by virtue of this amazing and immediate transport. I've gone from the Virgin Islands to California and Maine to Texas visiting via computer projected to large screen. The visits are completely 'do-able' and available for your consideration. I can't wait to see where I get to 'visit' in the coming year! Thanks for taking the time to allow me to introduce myself! I'd like to reward one lucky winner with a signed and personalized set of all three of my picture books. Follow the Rafflecopter directions to enter. Good luck! By all means follow me on Pinterest! I now have 127,000+ followers on my boards. 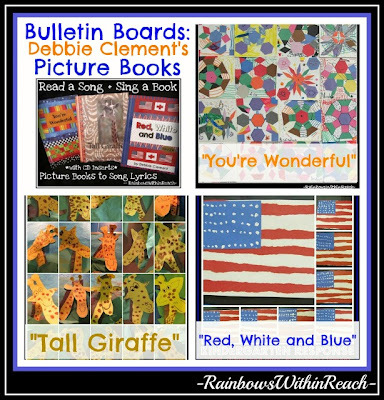 My pinboard collections are organized around my books, DVD, and songs. I host several collaborative pinboards that are all the rage. As you might expect I have one for "Children's Art" and another for "Writing and Fine Motor" that are especially popular! for my National "I Teach Kindergarten" KEYNOTE! Your creative process as an adult is significant to me as well. I offer my blog as a storehouse of inspiration and motivation for you and your own creativity. I'll conclude with offering you this article for making your own dreams come true. It includes my reflections following my first national keynote address. Dreams really do come to fruition, but they require focus and determination, regular work and patience. Having the support of others as you make progress is pivotal for the journey. I'm appreciative to my fellow bloggers (and Bern in particular) for their continual encouragement and support. Debbie works hard to stay connected. Follow her blog RainbowsWithinReach, her collaborative blog PreK+K Sharing, her FB page, her Twitter account, her new Instagram efforts, her Sulia articles, her Google+ and look here for her on LinkedIN. Music makes the world go round....I always used music to teach my special ed preschoolers. All children respond to it. Love Deb and it was great to learn more about her! Thank you! 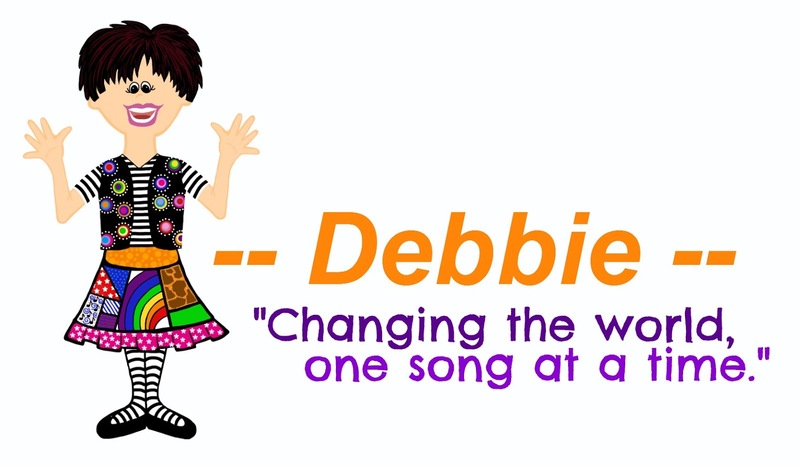 It has been very interesting finding out about Debbie and her books and music. Thank you!